Just married sign on the back of a Harley Davidson as the bride and groom kiss in the background. Wow...... I could probably just stop the text here and just run a bunch of photos from Joan and Daniel's rustic barn wedding at County Line Orchard in Hobart, Indiana. We fought with rain a little, but ultimately we won. It was an epic wedding with the bride and groom's beloved Harley Davidson on display as well as a classic hot rod. We began the day with the girls getting ready at the couple's home. Team Bride was in good spirits and ready to rock. Even our flower girl had her own custom tee shirt to model. Team Bride gets ready for the big day. The bride opens the balcony doors in the bridal suite at County Line Orchard. The first look / reveal of the bride and groom saw the maid of honor and best man opening the gates of the white fence for Joan to approach her husband to be. Daniel held out his hand and the two embraced with myself and second photographer Bridget capturing the wonderful moment from different angles. First look for the bride and groom at their June wedding. Soon we were off for pictures featuring the bride and groom and their Harley. We did everything from posed "biker chic" images to action shots of Joan and Daniel roaring away. Who gets to the drive the car? Seems as though the bride is staking her claim. It was a lot of fun!! 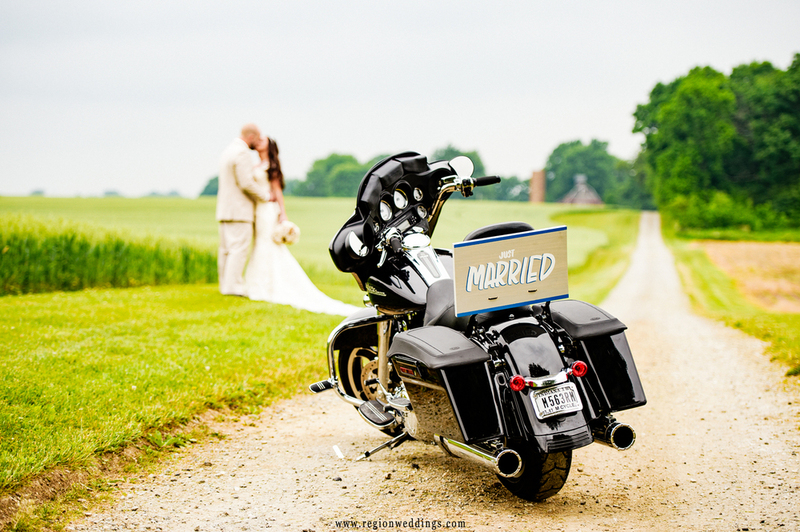 The bride and groom face each other on their Harley Davidson bike with farmland as their backdrop. 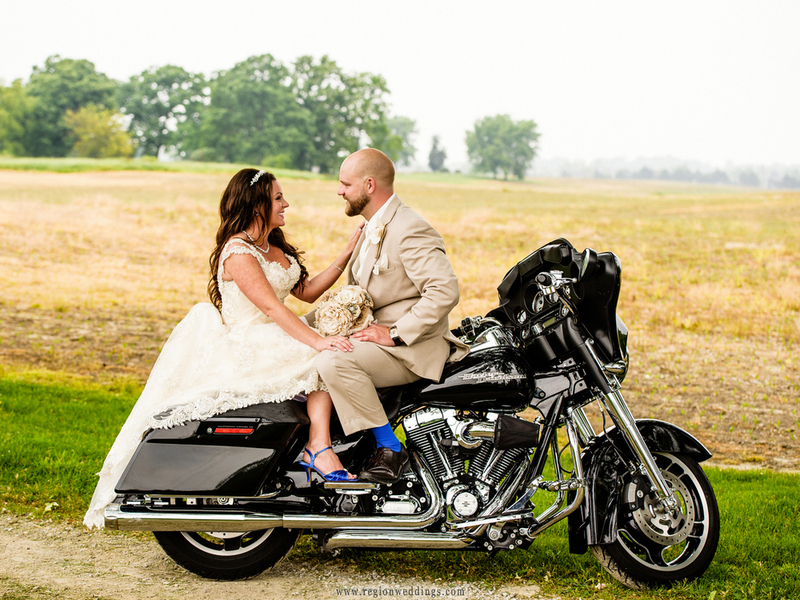 Fun wedding photos of Harley's, hot rods and a bride and groom. We took a detour over to Deep River County Park for wedding party photos and then it was barn shots with the silo at County Line Orchard. Wedding photos at Deep River County Park. Fun wedding photos at County Line Orchard in Hobart, Indiana. The barn wedding ceremony took place in the Northern barn at County Line Orchard. Daniel and Joan were pronounced husband and wife by their good friend John and then it was off to the reception in the South barn. Barn wedding ceremony at County Line Orchard. The reception featured a wonderful meal and the signature County Line donuts. A fire pit was open for roasting marshmallows and DJ 219 Productions brought the room lighting and the beat. Looks like the flower girl decided to crash the first dance as well. What a party it was!! June wedding reception at County Line Orchard. The flower girl charges onto the dance floor during the first dance at County Line Orchard. 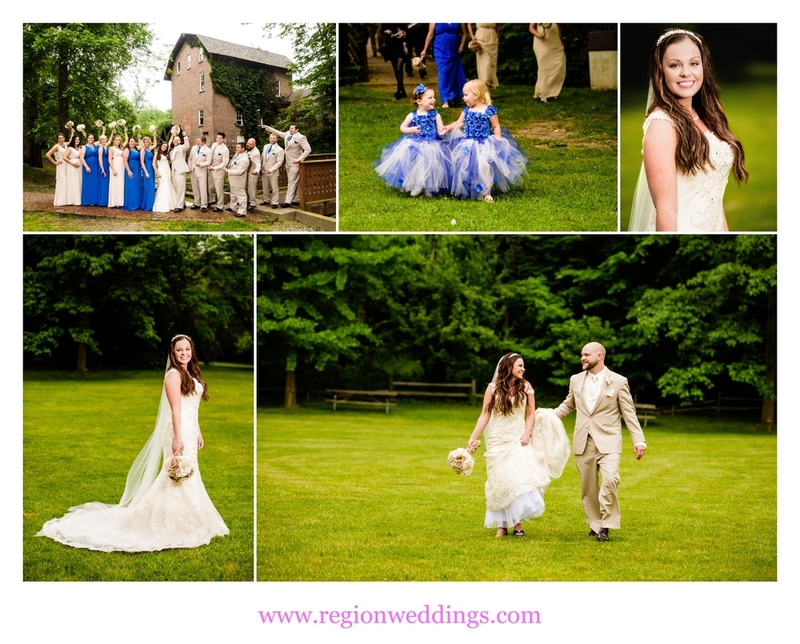 I hope you have enjoyed this sneak peek look at Joan and Daniel's June wedding at County Line Orchard in Hobart, Indiana. Stay tuned to social media below for more images. To inquire about your wedding date, please fill out the Contact Form and I will be back with you right away.